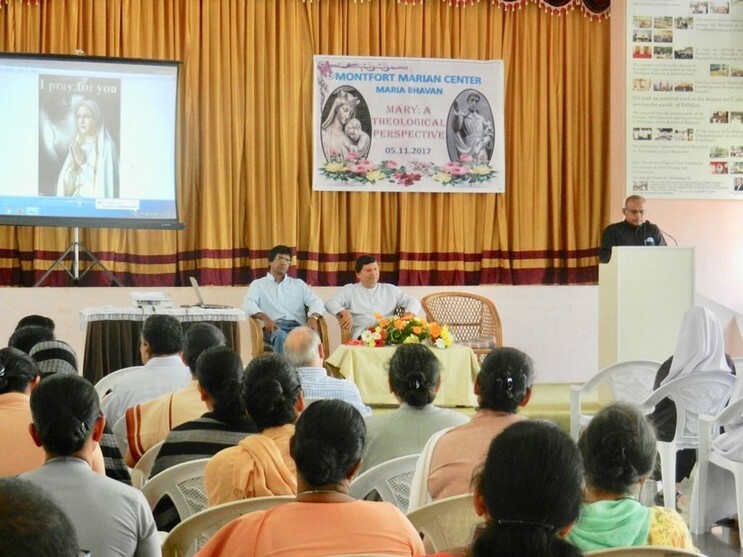 BANGALORE, India - On 5th of November 2017, there was a seminar on “Mary: A Theological Perspective,” which was arranged by Rev. Fr. Peter Mascarenhas who is the director of the Marian Centre in Maria Bhavan. For this seminar there were many priests, sisters, brothers from various congregations and institutions and also some Montfortian lay associates who took an effective part in it. The total number of the participants was about ninety. The programme began with the Holy Eucharist by Fr. J. Joseph who was also the moderator of the two sessions. After a tea break, Fr. Selva Kumar gave his welcome address, followed by the two sessions and fifteen minutes of questions and clarifications. Fr. Peter who was the resource person of the seminar began his topic with the quotation from a famous theologian by name Karl Rahner, a Jesuit priest who said, “Christianity, the only religion that needs a mother.” In his presentation he highlighted the following points in two sessions: The importance of Mary, Apparitions, Call of Mary, Mary’s Fiat, Three qualities of discipleship, From implicit to explicit Mariology, Mary and the church in Vat II, Mary Mother of the church, and Mary and the church in post Conciliar Megisterium etc. Moreover, in his presentation there was an interaction with the participants. He also shared some of his personal experiences, gave examples from various resources pertaining to the topic and he spoke about empowerment of women. The participants who attended the seminar were immensely happy and they expressed that they had benefitted a lot from this seminar.